You aren’t sure about the placement of each element in the chart. You aren’t clear about who your users will be for the data viz. You don’t know where to put your menu items so they will be seen. Fortunately, cognitive scientists have determined that people read text and images in certain specific patterns. As you organize the information in your visualization, using these standard patterns help your users to scan the information quickly and easily. Z pattern: The Z pattern is often used for text and visual layouts. As would expect, when a person’s eyes follow the Z pattern, his eyes track from left to right across the top, down to the left, and then across the page at the bottom. The figure below shows the points of the Z numbered in the order in which the reader’s eyes track across information on a page. How does this pattern affect the layout of your content in a visualization? Your reader will scan the content along the path of the Z, so you should place the title at the top of the Z, along with any key content. Position more visual content in the middle and along the bottom. 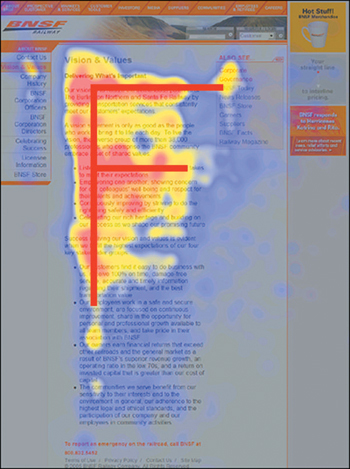 F pattern: Cognitive scientists have created heat maps to determine where the human eye goes when it looks at a web page. As shown in the following figure, heat maps are composed of concentrations of colors that show where readers scanned the page. The most intense colors (red and yellow) show where readers’ eyes lingered longest; readers spent less time looking at the blue areas. As you can see, the red and yellow areas resemble an F.
The F pattern on a heat map. If you stick to these two layout patterns at the beginning, you can’t go too far afield when designing your data viz. Balance: When you place items in your visualization, be sure to maintain balance. When too many items are clustered together, it’s difficult for people to see how those items are related. Color: Random use of colors such as red can be misleading, causing the viewer to see an alert when there’s no cause for alarm. Hierarchy: You’re familiar with the use of hierarchy as it pertains to a text outline. 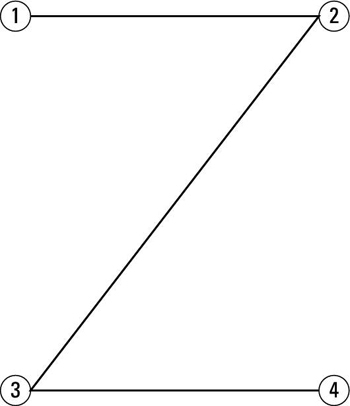 The top level of the outline may have a Roman numeral, the next level may have a capital letter, and then the third level may have a number. In a visualization, you can tell based on size or position which items are higher or lower on the hierarchy. You don’t need to use numbering as you do in a written outline. Repetition: Repetition helps people become familiar with the items in a design. If you use the same elements throughout, people see a unified whole and don’t have to guess what certain elements mean because they’ve seen those elements before. White space: The use of white space has been championed for decades. White space allows content to “breathe” — that is, your image benefits from ample space around the objects in the visualization. Too much clutter makes it hard for people to take in the image at a glance.